Find the online calendar/schedule here. Vendors must have a City of Sea-Tac business license, King County health permit, and email in a certificate of insurance for the address above. In order to obtain your SeaTac business license, you will need the signed property authorization form, we will coordinate for you. Vendors are also required to have a Puget Sound Regional Fire Authority permit which is triggered upon your license application with the city, and you will receive a spot inspection weeks after submitting your application with city hall. 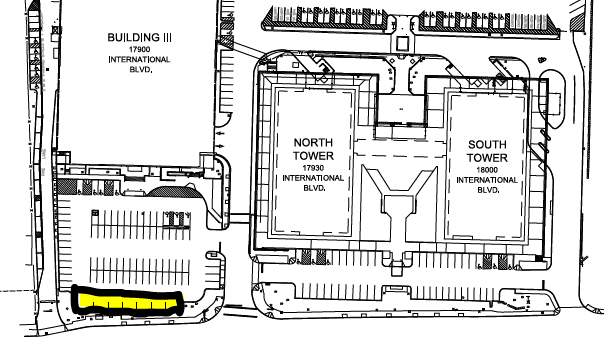 Parking: Security will have cordoned off the parking at the far end of Building 3, next to the North Tower at the address above, and per the diagram (in yellow). Security can be reached at 206-242-8970 to assist with moving the cones, etc. once onsite. Be prepared for a lot of people expecting fast turn-arounds and approximately 90-tickets each, consider accepting text in orders ahead. Other questions, on location point of contact is: Brittney Farrow at 206-582-4233.